After such a great tour of St Petersburg, Russia the day before, we couldn’t wait to get out and discover some more of the city’s delights. Rain had been forecast for today, but yes, that was definitely blue sky and sunshine we could see peeking through the clouds! We rose early to enjoy our hotel Lotte’s fabulous buffet breakfast. Before we came to Russia, we had this preconceived idea that Russian food really wasn’t going to be up too much, and with all the walking we do when we travel, we would easily be able to lose a few unwanted kilos. So wrong!! From what we have tasted so far, it looks like we were going to be seriously piling on the kilos instead! So at 10:30 am, we set off with our guide Elena for a short walk alongside the river to the Yusupov Palace. The Yusupov Palace belonged to the incredibly wealthy Yusupov family and is just one of a few aristocratic homes left in St Petersburg which still has most of its original interior. Now this is where having an excellent guide like Elena from Strelka Travel comes in handy 1) because she’s just a mindful of information and stories and 2) most of the signage in the Yusupov Palace is written only in Russian, although audio guides in English and other languages were available. The inside of the palace was quite stunning with many of the rooms painted in different styles, with beautiful ornate chandeliers, frescoes, and tapestries. 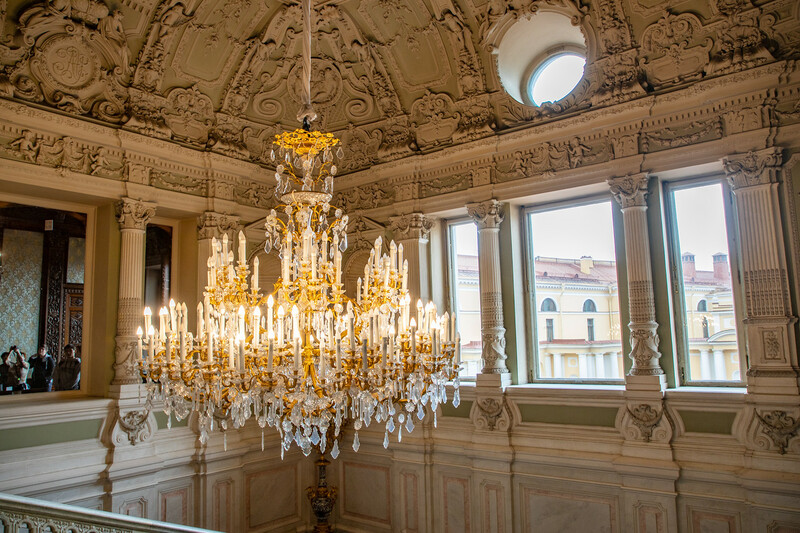 Yusupov Palace even features a stunning ornate Rocco theatre which still shows productions today – that would be so cool to see! But it’s not all beautiful rooms that you have come to see here. The Palace has a gruesome history. This is where Rasputin was murdered! 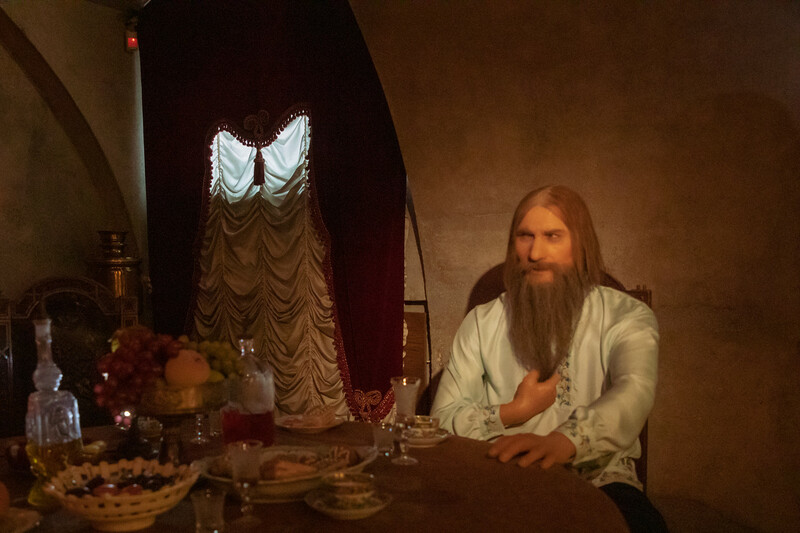 There are many legends and stories of what exactly happened that night on 16 December 1916, but the exhibition that is shown in the basement of Yusupov Palace is based on the fascinating autobiography of Prince Felix Yusupov who was one of the conspirators in the initial poisoning of Rasputin. Apparently, Rasputin was taking too long to die by poisoning from potassium chloride so was shot eleven times but somehow he still managed to survive. Finally using clubs, they hurled his body into the icy river where he died from hypothermia or did he? The way our guide Elena described the story was far better than I could ever do, but it was a fascinating story and well worth seeing. It was a very cool exhibition. A year later, Yusupov Palace was seized by the Bolsheviks. We left the Palace and continued our tour of St Petersburg with Elena our guide and myself singing and humming along to Boney M’s Rasputin, well you would, wouldn’t you? Jonathan denied all knowledge of ever hearing that song. Admit it, you’ve started humming it too now! If you haven’t seen it watch the video and you will. As we strolled down by the river, wondering what was in store for us next. A canal river boat pulled up beside us and off we all went. Wow, we didn’t expect that. It was warm enough to sit up on deck and admire the beautiful buildings from the water. We even cruised right by our Hotel Lotte. Getting an entirely different perspective of St Petersburg was lovely. After such a great time exploring, we were ready to eat again, unbelievable really after the amount we ate earlier. 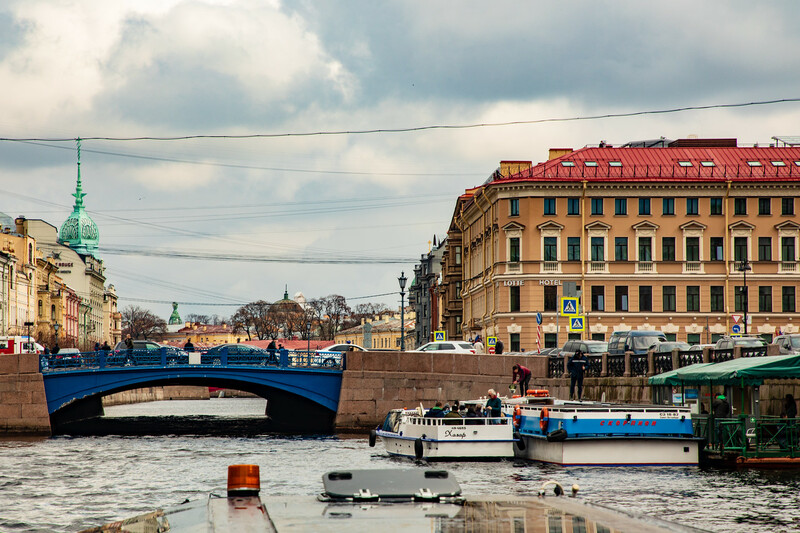 We had a late lunch at the Terassa, which is a popular rooftop restaurant located on one of St Petersburg’s tallest buildings overlooking Nevsky Prospekt – the city’s main shopping street and Kazanskiy Cathedral. After a scrumptious late lunch, we had a few hours left to explore the city by ourselves. 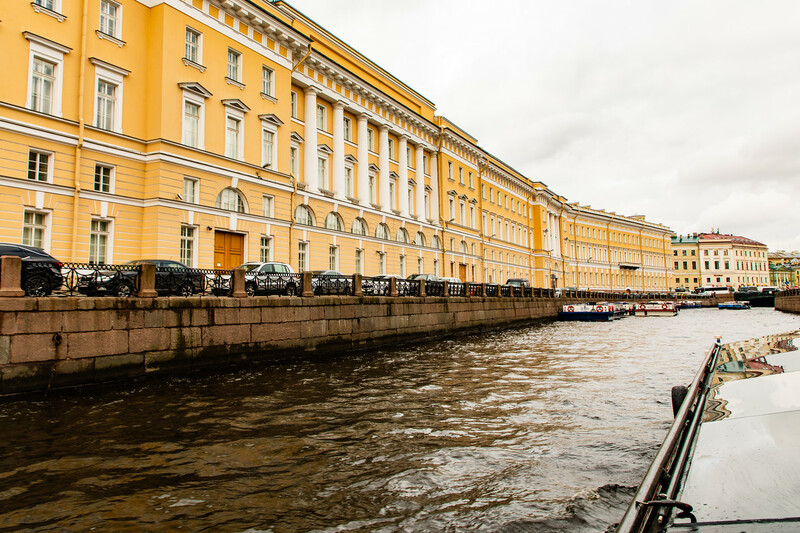 St Petersburg is such a picturesque city, far more beautiful than we had expected. We felt perfectly safe walking by ourselves and with the iconic dome of St Issacs’s Cathedral always in view, it was impossible to get lost. But sadly our tour of St Petersburg was coming to an end, but a new adventure was about to begin. Next stop, the famous Red Arrow night train from St Petersburg to Moscow! Excellent! Your story is short, but very interesting. And the photos are wonderful. Thank you!